For other meanings, see Waltham Abbey (disambiguation). Waltham Abbey is a suburban market town in the Epping Forest District of Essex, the metropolitan area of London, and the Greater London Urban Area. It has a population of about 21,149. Lying on the outskirts of North East London, it is located 14 miles from central London. It is on the Greenwich Meridian, between the River Lea in the west and Epping Forest in the east, situated north of the London Borough of Waltham Forest, north-east of the London Borough of Enfield, and east of Waltham Cross in the Borough of Broxbourne, Hertfordshire. It is one of the possible resting places, along with Bosham, of King Harold Godwinson, who died in the Battle of Hastings in 1066. Waltham Abbey takes its name from its former abbey, now the Abbey Church of Waltham Holy Cross, a scheduled ancient monument that was prominent in the town's early history. 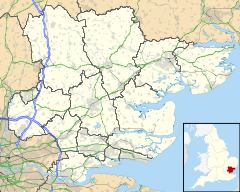 The town is within the large civil parish of Waltham Abbey which was known as Waltham Holy Cross until 1974. The parish has a town council and is twinned with the German town of Hörstel. The name Waltham derives from weald or wald "forest" and ham "homestead" or "enclosure". The name of the ancient parish was Waltham Holy Cross, but the use of the name Waltham Abbey for the town seems to have originated in the 16th century, although there has often been inconsistency in the use of the two names. Indeed, the former urban district was named Waltham Holy Cross, rather than Waltham Abbey. There are traces of prehistoric and Roman settlement in the town. Ermine Street lies only 5 km west and the causeway across the River Lea from Waltham Cross in Hertfordshire may be a Roman construction. A local legend claims that Boudica's rebellion against the Romans ended in the neighbourhood, when she poisoned herself with hemlock gathered on the banks of Cobbins Brook. The recorded history of the town began during the reign of Canute in the early 11th century when his standard-bearer Tovi or Tofig the Proud, founded (or rebuilt) a church here to house the miraculous cross discovered at Montacute in Somerset. It is this cross that gave Waltham the earliest suffix to its name. After Tovi's death around 1045, Waltham reverted to the King (Edward the Confessor), who gave it to the Earl Harold Godwinson (later king). Harold rebuilt Tovi's church in stone around 1060, in gratitude it is said for his cure from a paralysis, through praying before the miraculous cross. Waltham's people used the abbey as their parish church, and paid their tithes, worked the glebe as well any of their lord's land, and paid other dues to the canons. Legend has it that after his death at the Battle of Hastings in 1066, Harold's body was brought to Waltham for burial near to the High Altar. Today, the spot is marked by a stone slab in the churchyard (originally the site of the high altar before the Reformation). In 1177, as part of his penance for his part in the murder of Thomas Becket, Archbishop of Canterbury, Henry II refounded Harold's church as a priory of Augustinian Canons Regular of sixteen canons and a prior or dean. In 1184, this was enlarged so that Waltham became an abbey with an abbot and twenty-four canons, which grew to be the richest monastery in Essex. To the abbey's west and south, the town grew as a linear development around a crossing road, although it had a single north-south "High Street" as late as 1848. In the medieval and early Tudor periods, there were two guilds in the parish, each with an endowment for a priest: the Brotherhood of Our Lady, and the Charnel Guild, whose priest was also the parish curate. The former, which existed from at least 1375, occupied the Lady Chapel in the parochial part of the church. The Charnel Guild, which occurs as 'the Sepulchre' in 1366, probably used its crypt. The town's dependence on the Abbey is signalled by its decline after the Abbey was dissolved and partially demolished in 1540, the last working abbey or monastery to be dissolved. Waltham Abbey vicarage is a 17th-century timber framed and plastered building. It was given by Edward Denny, 1st Earl of Norwich to create the first curacy, but was much altered in the 18th century and later, and was more recently architecturally Grade II*listed. In the early 19th century the church held three Sunday services, including one in the evening for the local factory workers. In 1862, Holy Communion was celebrated monthly and attended by about 100. In the 17th century there were four churchwardens (who fulfilled some roles of local government, collected and distributing poor relief): one each for the town, Holyfield, Upshire, and Sewardstone. Joseph Hall, curate from 1608, was later Bishop successively of Exeter and Norwich. A complete diocesan list of curates was printed to 1888 and Thomas Fuller, author of The Worthies of England and of the first History of Waltham Abbey, was curate 1649–58. In the 17th century, a gunpowder factory was opened in the town, no doubt due to good river communications and empty marshland by the River Lea and this now forms the museum below. The factory was sold to the government in 1787 and was greatly expanded during the next century, becoming the Waltham Abbey Royal Gunpowder Mills. In the 19th century, searches began for more powerful and reliant propellant explosives, and guncotton was developed here by Frederick Abel, starting in 1863. Cordite production began in 1891 and the site was enlarged several times. The site was an obvious target during World War II, and a German V-2 rocket landed near the factory in Highbridge Street on 7 March 1945, causing considerable damage to property and large loss of life. The factory eventually closed in 1943, and the site was developed into an explosives research establishment. There was also a fulling mill at Sewardstone around 1777 and a pin factory by 1805. Silk and calico printing were also important industries. The River Lee Navigation was also improved, a new canal cut across the marshes was opened in 1769, bringing more trade to the town. Outside the town, the parish is largely rural and agriculture has been an important occupation. The Grave of King Harold Godwinson. In the first half of the 20th century, the area was extensively covered in glass-houses and market gardens. Gravel extraction has also long been a major industry in the Lea Valley, leaving a legacy of pits now used for recreation and an important wildlife habitat. In 1959–60 all of the church's houses and land were converted to stock or bank investments. No rectory has existed — the benefice before becoming the present vicarage serving four churches in the wider area was a perpetual curacy — a relevant fact for the purposes of chancel repair liability that therefore cannot exist. In the 1960s and 1970s, the population of the town increased, partly by an extensive programme of clearances and redevelopment in the town centre, and partly by the development of housing estates on the outskirts, such as Roundhills and Ninefields. The River Lea, which forms the county boundary with Hertfordshire, is the town’s western boundary, and the eastern boundary runs through Epping Forest. The land rises gradually from the marshes and meadows by the river to a small plateau of london clay in the east, 60–90 metres above sea level, capped in the highest parts by the sand and gravel of Epping Forest. On the river the elevations range from 22m in the northwest[n 1] to 13.5m in the southwest[n 2]. To the southwest, occupying a former course of the River Lea, is the King George V Reservoir, opened in 1913. Cobbins Brook, a tributary of the River Lea, crosses the parish from east to west. Waltham Abbey parish includes in its 41 km² the villages and hamlets of High Beach, Holyfield, Sewardstone and Upshire. The M25 motorway runs to the south of the town through the middle of the parish and can be accessed east of the town at Junction 26 via Honey Lane or the rural relief road, the A121 directly south of the motorway. The town has neighbourhoods of Ninefields, Roundhills, Marriot and the Meridian Park. Cobbins Brook flows through the town from the east and northeast. The Welsh Harp in the Market Square is a half-timbered inn, mostly dating from the 15th century. The Lychgate passage beside the inn leads to the churchyard. A former inn, at the corner of Sun Street and the Market Square, is now a shop. A carved wooden bracket in the form of a hermaphrodite holding a jug supports the projecting upper storey. The Town Hall in Highbridge Street, dating from 1904, is a fine and rare example of an Art Nouveau public building. Two notable 18th-century buildings are Essex House in Sewardstone Street and St. Kilda’s in Highbridge Street. At Upshire is a group of cottages known as the Blue Row. They are weatherboarded and with bark still visible on the roof. Lawrence of Durham (c.1110–1154), poet and prior, was born at Waltham. John Foxe (1516/17–1587), author of Foxe's Book of Martyrs, lived in a street now called Foxes Parade. The book was hung in chains on a pillar in Waltham Abbey church. BBC News presenter Kate Silverton grew up in the town. The medieval Waltham Abbey Church was kept as it was close to a town and is still used as a parish church. In addition there are other remains of the former abbey – the Grade II*listed Midnight Chapel, the gatehouse, a vaulted passage and Harold’s Bridge – all in the care of English Heritage. These grounds are notable for the reputed grave of Harold II or "Harold Godwinson", the last Anglo-Saxon King of England. Housed in a building dating back to 1520 is the Epping Forest District Museum, which tells the story of the people who have lived and worked in this part of south Essex from the earliest times to the present. On the site of a former gunpowder factory another museum illustrates the evolution of explosives and the development of the Royal Gunpowder Mills (an Anchor Point of ERIH, The European Route of Industrial Heritage) through interactive and traditional exhibitions and displays. The site hosts living history and battle re-enactment events most summer weekends and also offers a self-guided nature walk that shows visitors the ecology that has reclaimed much of the remaining 175 acres (0.71 km2). The former gravel pits in the Lea Valley and parts of the former Abbey Gardens are now in the care of the Lee Valley Regional Park Authority for recreational use and nature conservation. The Epping Forest Conservation Centre in High Beach provides information, maps, books, cards, displays and advice for visitors to the area. Waltham Abbey has one senior non-League football club, Waltham Abbey F.C. which plays at Capershotts. The Anglican abbey church is dedicated to St Lawrence. The town has long had a Catholic church. For some decades this was in a former Methodist chapel, an irregularly shaped Edwardian building of stone-dressed red brick with a roof of Welsh slate tiles in free late gothic style with a belfry. In 2008 the congregation moved to a more modern building, and sold the former building to an Evangelical Free church. Waltham Abbey is served by Waltham Cross Station on the British Rail network, Theobald's Grove and Chingford stations on the London Overground network, and its nearest London Underground station is Loughton, served by the Central Line. Waltham Abbey is located on the M25 London Orbital Motorway, allowing efficient transport by motor vehicle around London. Several bus routes are operated in Waltham Abbey, some of which were originally operated by London Transport. ^ W.R. Powell, ed. (1966). "Waltham Holy Cross: Introduction and manors". A History of the County of Essex: Volume 5. Institute of Historical Research. Retrieved 30 November 2012. ^ a b c d e f g h W.R. Powell, ed. (1966). "Waltham Holy Cross: Churches, schools and charities". A History of the County of Essex: Volume 5. Institute of Historical Research. Retrieved 30 November 2012. ^ Waltham Abbey Vicarage Grade II*listing Historic England. "Details from listed building database (1124127)". National Heritage List for England. Retrieved 30 November 2012. ^ Royal Gunpowder Mills, a museum by the site of the works, a Scheduled Ancient Monument, see listing Historic England. "Details from listed building database (1016618)". National Heritage List for England. Retrieved 30 November 2012. ^ A. G. Rigg, "Durham, Lawrence of (c.1110–1154)", Oxford Dictionary of National Biography (Oxford, UK: OUP, 2004) Retrieved 16 March 2016. Pay-walled. ^ Grade II*listed Midnight Chapel Historic England. "Details from listed building database (1337453)". National Heritage List for England. Retrieved 30 November 2012. ^ The Abbey ruins a Scheduled Ancient Monument, see article on its surviving church and its listing Historic England. "Details from listed building database (1002181)". National Heritage List for England. Retrieved 30 November 2012. ^ Roman Catholic Church of St Thomas More and St Edward — Grade II listing Historic England. "Details from listed building database (1306376)". National Heritage List for England. Retrieved 30 November 2012. Wikimedia Commons has media related to Waltham Abbey. Wikisource has the text of the 1920 Encyclopedia Americana article Waltham Abbey.